This works for a mini package service to ensure local city tour facilities to our clients travelling in Indore. We offer this service for half day car hire services including Airport Transfer in Indore, Car rental service for Marriage, party and event, Corporate Cab Rental in Indore, Railway Transfer, visiting hospitals and a lot more. The service is extremely useful for travellers looking for pickups and drops facility from one destination to the other within Indore such as airport pickups and drops, hotels pickups and drops, railway station pickups and drops, and bus stand pickups and drops. Our trained chauffeur will reach the appointed destination in time dressed in uniform. We have designed special packages for outstation travel. These are a perfect way to spend time with friends and loved ones outside the city limits. The package is arranged as per the interests and requirements of our clients. We also arrange for group packages from Indore to places nearby. The cars sent across will accommodate group size to ensure maximum convenience. This is a typical to and fro service offered in Indore for those who would like to make to and fro trip to Indore. We offer this service to multiple destinations from Indore. The package has been devised as one way service to serve our clientele for one way drop to their destinations from Indore. We also offer special Indore city sightseeing tours and any other customized cab rental packages. 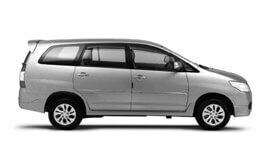 At My Taxi India, we guarantee the best car rental services in Indore at highly affordable prices. Indore enjoys a borderline humid subtropical climate and tropical savanna climate. The place enjoys 3 distinct seasons namely; summer, monsoon and winter. Indore is considered to be the most populous city in the central India. As per the 2011 census, Indore has about 2,160,631 residents. Indore is a leading commercial center in the state of Madhya Pradesh. The rapid growth of the city is contributed by owing to Industrial Policy framework, improved living standards, and High Educational standards. The oldest contributor of economy is Textile manufacturing and Trading industry. Today, the Real Estate business is also doing really well in Indore. Indore is widely known for a wide range of sightseeing opportunities and its rich cultural heritage. Once ruled by some of the greatest rulers, the place has received historical monuments and religious places in its legacy. Some of the best places to visit in Indore include Chokhi Dhani, Nakhrali Dhani, Central Museum, Indore Museum, Chhatris, Lal Baag Palace, Kanch Mandir, Rajwada, Town Hall or Mahatma Gandhi Hall, Nehru Park, and a lot more.